Looking for a family focused, fun, and affordable event for the whole gang? This is it! The beauty of this location is spectacular. It is located in the Black Hills near Keystone, SD. This is the site of our annual Family Fly Fishing Weekend Retreat. Register the whole family for this great event. Food and lodging are included in the suggested donation. The meals include breakfast, lunch, and dinner on Saturday and breakfast Sunday morning. It is our goal to offer all our events at low cost or no cost. But prices continue to rise for us and for our host sites just as they do for you and your family. Please consider donating the following suggested donations to help us recoup the cost of expenses. These fees are suggested and not required. The prices for this year’s event are Adults $90, kids 10-17 years $75, 3-9 year olds $50, 0-4 years $0. 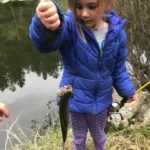 Fly fishing will be the focus, and we will provide the equipment for you and the family if you have never done it before. If you have your own equipment, bring it along. Instruction is provided so you may learn to fly fish. Please bring your own sleeping bag/sheets, pillow, towels & toiletry items. There will be a speaker on Saturday night and Sunday morning.